Blue Sky Mobile Media offers a unique outdoor movie experience with a portable drive-in movie feature. Outdoor movies at the local drive-in theater were once a celebrated tradition – we are reinvigorating that tradition! 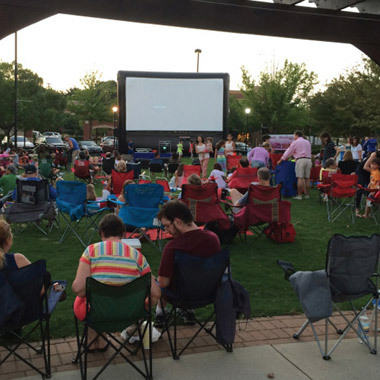 We can create a drive-in or lawn-seating movie experience in your outdoor venue. With a variety of inflatable movie screen options to choose from, complete with a state-of-the-art sound system, we can help customize your outdoor experience. Pre-movie activities are also available including gaming, karaoke and dj services. Our friendly staff of professionals can create a movie experience, complete with concessions, like no other. We provide unique, family-friendly outdoor movie experiences to shopping centers, festivals, clubs, schools, townships and more. Our turnkey services include professional staffing onsite throughout the event.